Oil Free Diaphragm Vacuum Pressure Pumps Oil Free Diaphragm Vacuum Pressure Pumps These are 100% Oil Free, wherein not even a single drop of oil is used. These are a boon for Vacuum & Pressure Applications, where even slightest Environmental Contamination through oil mist is forbidden. Chemical Analysers, Pollution Control Equipments, Gas Monitoring, Nitrogen Generating Sets, Ozone Generators, Operating Clinical, Medical & Scientific Laboratory Equipments, Suction of Desoldering Waste, Filtration, Dentistries & Spray Painting. 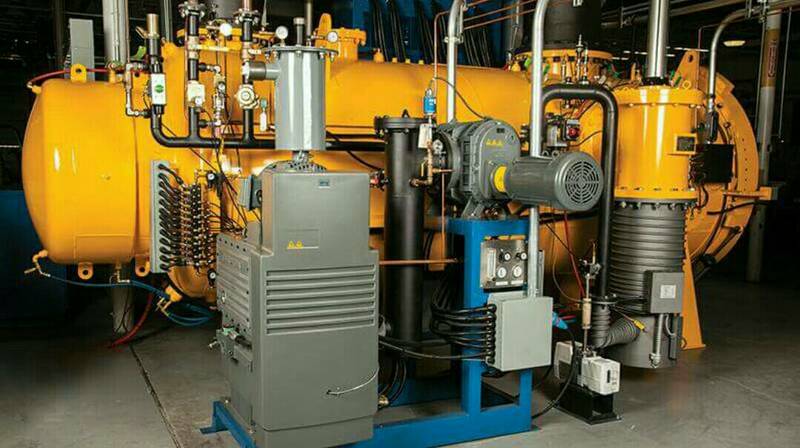 Dual-Stage Rotary Vane Pumps are oil sealed and feature a rugged design—capable of pumping speeds from 3.5 cfm to 53 cfm and an ultimate vacuum of 10-3 Torr or 29.9inHG. Lightweight, quiet, and compact, they feature an anti-suckback valve and gas ballast knob, quick disconnect ISO/KF fittings for inlet and outlet, and are ideal for a variety of applications. Specifications Ideal low cost replacements for Varian, Leybold, Pfeiffer, Edwards or Alcatel two-stage rotary vane pumps Well ventilated, cool running pumps minimize oil backstreaming and thermal degradation Positive oil feed system enables optimal pump lubrication Rugged, well-known design makes it easy to maintain Low operating costs Single-phase motors available for either 120V or 220V with switch Applications Vacuum degassing Cylinder filling Sampling applications A/C and refrigeration evacuation Vacuum ovens and furnaces Sputter and deposition systems Freeze dryers Electron microscopes Backing turbo pumps Contact us for a quote , or order direct online with our partner distributor dhve. DHVE Silicone Diffusion Pump Oil DHVE Vacuum’s silicone diffusion pump oils – DHVE 702, 704, and 705 – are durable fluids designed for a variety of high vacuum applications and for fast pumping large volumes of gas. They are drop-in replacements to – and completely miscible with – the DOW CORNING® DC-702, 704, and 705 silicone fluids, respectively. DHVE 702, 704, and 705 silicone diffusion pump oils offer equal or better performance compared to the equivalent DOW CORNING products. Product Properties Areas of Application Specifications MSDS DHVE® 702 DHVE702 is designed for rapid pumping of large volumes of gas and has the important advantages of thermal stability and oxidation resistance. This silicone-based fluid is resistant to air at operating temperatures, the pumps require no cooling between cycles. DHVE® 704 DHVE704 is a silicone diffusion pump oil with low vapor pressure and great thermal stability, making it desirable in processes such as vacuum coating, metallurgical work, and various other applications. It offers superior vapor pressure capabilities and quick pump down cycles. DHVE® 705 DHVE 705, with a higher viscosity than the otherDHVE fluids, is designed to produce an ultra-high and ultra clean vacuum. With the use of traps, DHVE 705 is capable of attaining a pressure of 10-11 torr, and without a trap 10-9 torr. DHVE® 940 DHVE 940 is a silicone diffusion pump fluid with both low vapor pressure and thermal stability, enabling it to be used in vacuum coating, metallurgical work, and various other applications. It is oxidation and explosion resistant, and offers quick pump down cycles. DHVE Hydrogen Furnaces By operating in hydrogen or any reducing/inert atmosphere up to 2300°C, dhve's positive pressure coldwall furnaces are an ideal solution to many high temperature processes that require an oxygen-free environment. Easily and reliably ramp up to desired temperature in minutes or days, depending on your requirements. A standard, programmable "bubbler" can be used for creating wet hydrogen to further aid in removing hydrocarbon contaminants when a dry atmosphere is not required. Additionally, optional heated bubblers and dewpoint monitors can be used to easily achieve and control the higher dewpoints necessary for metalizing ceramics. Most of our models will roll through a standard interior door frame with little to no deconstruction. All our furnaces are fully automatic. One button push performs: → Purge (displace atmosphere inside chamber with nitrogen) → Process gas fill → Bubbler for humidification of process gas → PID controlled ramp(s) to target temperature → Soak → Cooldown → Post purge (displace process gas inside chamber with nitrogen for safe opening) Hydrogen furnaces offer a lower cost alternative to high-vacuum furnaces if the process can allow for it. They are self cleaning, inexpensive to run and maintain, and process cooling in hydrogen is quick and controllable. Though built specifically to run safely in a hydrogen atmosphere, these furnaces can just as easily run in any inert or reducing gas type such as argon, nitrogen, forming gas (dissociated ammonia), helium, or any combination.